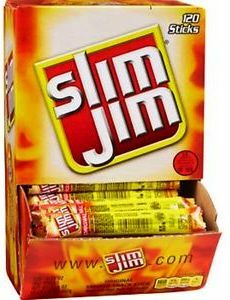 Snap Into a Slim Jim ? Slim Jim Beef Jerky Meat Sticks come in one box of 120 individually wrapped meat sticks, so you always have a strong, snack-sized supply snack sticks on-hand. Slim Jim Beef Jerky Meat Sticks are full of intense, smoky flavor. This bulk beef jerky snack box is bursting with 7-grams of protein in each meat stick. 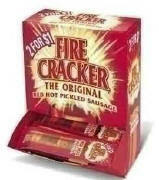 Snap into a Slim Jim and bite into the deliciously spicy flavor.